Design, Certification, Fabrication, Load Test, Fall Protection. Foley Engineering is a Qualified Independent Third Party per 30 CFR §250.732 (a) (1). We provide Shear Testing, Shear Calculations, Accumulator Calculations, and Verification of Maintenance and Testing. Verification of Testing and Maintenance. Shear performance tests are required by 30 CFR §250.731 (c). The shear tests must be verified by an independent third party prior to beginning any operation requiring the use of a BOP (30 CFR §250.732 (b) (1). A pressure test must be performed immediately after shearing, demonstrating that the BOP will seal at RWP for 30 minutes. The independent third party must provide verification that the BOP will shear all of the pipe used in the well at the MASP. Shear calculations determine the theoretical system pressure required to shear the pipe at MASP. The theoretical results are validated by the physical shear test. The calculations must demonstrate that two criteria are met: 1) the calculated shear pressure, at MASP, must be less than the system pressure rating of the BOP AND less than the system pressure available, and 2) the pipe used in the physical shear test is stronger than all of the pipe to be used in the well. This is accomplished by comparing the theoretical system pressure required to shear the test pipe (at atmosphere) to the theoretical system pressure required to shear each pipe in the well (at atmosphere). The independent third party must provide verification that the accumulator system has sufficient fluid to operate the BOP system. API Standard 53, which is included in the Well Control Rules by reference, stipulates methods for calculating the capacity of the accumulator system. Finally, the independent third party must provide verification that the BOP was designed, tested, and maintained to perform under maximum operational conditions. This verification may be based upon a review of maintenance and test records. If the surface BOP is used on a floating facility, then the verification must also confirm that the BOP stack has not been compromised or damaged from previous service. Design and manufacture special purpose tools. Foley is experienced in designing and manufacturing tools to solve specific problems, such as this large bore, high pressure emergency disconnect. 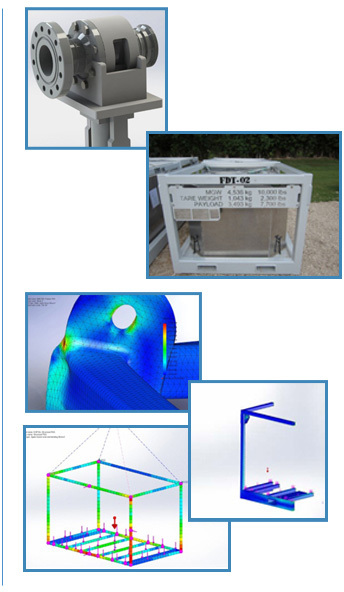 Foley has the capability to perform both linear and non-linear FEA using SolidWorks Simulation featuring both structural and solid element meshing. We can perform limited strain gauge analysis of tools and equipment. Foley can manufacture products using CNC lathe and machining center capability. Contact Foley Engineering to see if our capabilities fit your needs. Design and Fabrication of Offshore Skids to DNV and Gulf of Mexico Specifications. Foley can design new offshore skids, containers, and baskets to meet DNV or to meet the requirements of the major oil companies operating in the Gulf of Mexico. Foley Engineering Specification 10-901 includes the GoM design requirements in a single specification. To download a copy of Foley 10-901, click here. 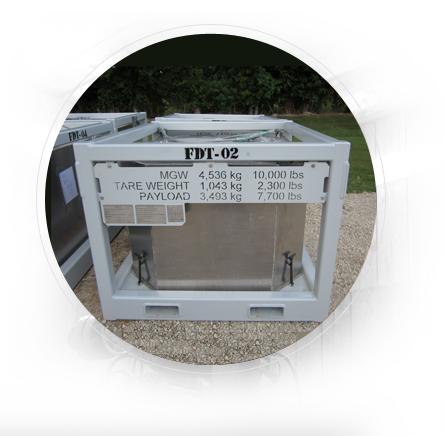 Foley can fabricate your skid or other equipment to meet the required specifications, including DNV 2.7-1. Certification of existing Offshore Skids to Gulf of Mexico Specifications. Foley has extensive experience in the certification of existing offshore equipment to meet the requirements of major oil companies operating in the GoM. API RP16ST stipulates that shears and blind/shears of CT BOP’s should be performance tested every six months. The pipe used for the shear test should have at least as high a shear pressure as any pipe used on jobs. To download a summary of shear test stipulations of API RP16ST click here. API RP16ST stipulates that slips and slip/seals of CT BOP’s should be performance tested every six months. 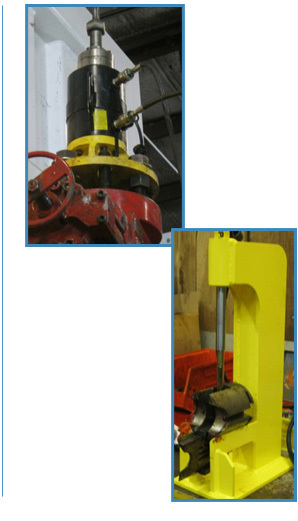 Foley has designed a unique load test fixture that allows the slips to be tested in both the pipe heavy and the pipe light directions while the BOP remains vertical in the stack. The pipe/slip rams of Dual Combi’s can be tested through the BOP without necessitating breaking down the stack. To download a summary of slip test stipulations of API RP16ST click here. Shear pressure depends in part upon the MASP and the properties of the pipe. Shear pressure calculations using the MASP and the properties of the CT reel used on a specific job are performed. 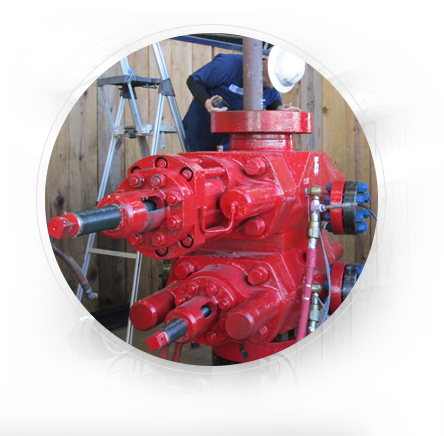 Accumulator calculations are performed to verify that charge pressure, pre-charge pressure, and accumulator volume are sufficient to operate a specific BOP stack and shear the specific pipe used on a job at the MASP of the well. API RP16ST stipulates that CT BOP’s should be shear tested every six months. The pipe used for the shear test should have at least as high a shear pressure as any pipe used on jobs. To download a summary of shear test stipulations of API RP16ST click here.